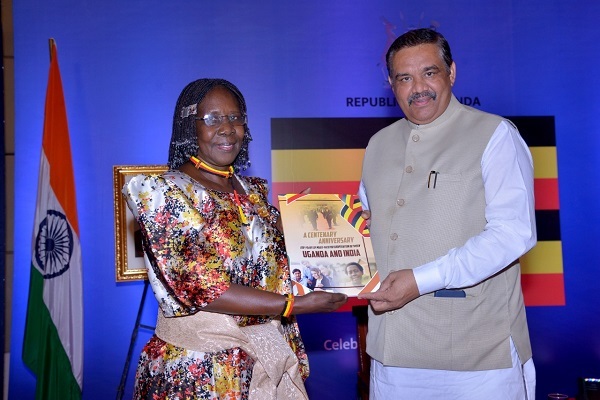 Uganda and India have launched a publication to mark 100 years of relationship. This happened at the celebrations for Uganda's 56th independence day hosted by Uganda's Mission in New Delhi. The chief guest Minister of State for Justice and Empowerment Hon. Sampla Vijay presided over the function. The Host H.E. Hon Grace Akelo, the High Commissioner of Uganda to New Delhi, received souvenir from HOM New Delhi. Among the 300-strong celebrants of Uganda's Independence Anniversary held on 9th October in New Delhi were 77 Heads of Mission accredited to India's capital. Heads of Mission came from all continents and provided great colour to the ceremony organized by the High Commission; and held the Grand Hotel. The Hon Vijay Sampla, Union Minister of State for Justice and Empowerment was the Guest of Honour. "Hon Minister, I would like to welcome you and to thank you for gracing this occasion. Today, I pay tribute to the founding fathers of our country, the country I am delighted to call home. Through their patriotism and foresight, our identity was curved out as a unique people in Africa and indeed as part of the global community. India has been a true and reliable partner of Uganda all along its 56-year journey of self-determination. India-Uganda relations have never been closer. Barely two months ago, Shri Prime Minister Modi JI, made a historic visit to Uganda and cemented these relations. Together with his host, President Museveni, he addressed the Ugandan Parliament, met with the Joint Business Forum and witnessed the signing of four Memoranda Of Understanding to pursue and advance mutual benefits for our two peoples. Hon Minister, on this occasion I wish to recall the contribution of India towards Uganda's success stories in our social, economic and political development. Prime Minister Jawaharlal Nehru laid the foundation for India's Africa policy noting that, "though separated by the Indian Ocean from us, it is in a sense our next-door neighbor." As part of that India's African neighborhood, Uganda has been a very old friend of India indeed. We owe our railway, which opened the country to international trade, to the expertise and labor of India's sons of the late 19th century. We owe the success of the post-independence administration to India's sons and daughters who were the human resource for civil service, education, health and other sectors. In particular we owe the establishment of a strong post-independence economy to the knowledge and knack of Indians. Today the country boasts of the attainments of its Ugandan Indians, who together with a growing Indian Diaspora in the country number some thirty thousand plus People of Indian Origin. Augmented by the expertise and technology of this diaspora, Uganda's economic cooperation with India is valued at US$1.3 billion; and is in fast ascendancy. India has consistently been among the top FDI into Uganda and among the largest trade partners. Uganda treasures this partnership and is a willing player in sustaining it."